Has your car, motorcycle or SUV broken down? Have you been involved in a collision with another vehicle and need emergency towing? Newway Towing’s light duty towing services in San Rafael are the ideal solution for any breakdowns, accidents or other problems keeping you stranded. We perform our services through a network of independently owned and licensed affiliates, who will provide you with a premier quality service, at highly affordable prices. Picture the scene: you’re driving your car along the highway at the end of a long working day. You just want to get home, have dinner and take it easy in front of the television. But your engine stops dead, your tires blow or a careless driver hits you from behind. Accidents and mechanical faults like these can strike at any time, day or night, weekday or weekend. 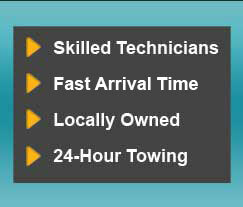 That’s why Newway Towing’s light duty towing is available 24 hours a day, 7 days a week, 365 days a year! Whether it’s a busy Monday morning or a snowy Saturday night, you can depend on our expert technicians to help you. Nobody likes waiting for the professionals to arrive — we know that. So, rest assured we’ll get to you as quickly as we can: we aim to never be more than 30 minutes away. Your vehicle is one of the most expensive possessions you own, whether it’s a car for personal driving or a truck for work. You want to make sure it’s in the safest of hands when it’s being towed, handled by experienced, highly-trained specialists who know exactly what they’re doing. This is exactly what you get when you call Newway Towing: our light duty towing services are the right choice for transporting cars, motorcycles, SUVs, small pickup trucks and other lighter vehicles. You’ll receive help from licensed technicians who undergo extensive training and use the latest equipment for top results every single time. All of our light duty towing trucks are well-maintained and kept ready for the next call. We believe in being part of our local community here in San Rafael. We know how important it is to see a friendly face and encounter a positive attitude when you’re stuck by the side of a road, waiting for your vehicle to be towed. Every tow truck driver on Newway Towing’s expert team is dedicated to being as helpful and approachable as possible on each callout. You can expect only the best quality of service while we tow your car, whether you live in San Rafael or are just visiting. Newway Towing’s light duty towing solutions are competitively priced, with affordable rates for our San Rafael customers on all budgets. Our pricing policy focuses on reasonable costs and full transparency: there are no hidden costs, no extra charges you don’t know about. We’ll offer a quote when you call and this is what you’ll pay. Simple, fair, honest. That’s the Newway Towing way. Looking to learn more about our light duty towing services in San Rafael? Just pick up your phone and give us a call now on (415) 870-3377!